I will be BACK later this afternoon just like that rug in my boys room. Phew, finally a rug I will not be sending back. I guess it's true when they say third ones a charm. P.S. - I got braces in my old years. I *love* the rug! Being from AZ here, it took me a long, long time (like, until about 2 years ago) to shake off my prickliness about anything remotely "Indian" or "Southwest" in appearance. But that Arizona pillow looks like the sweetest little thing! Did someone make it??? I love this rug - where are you getting it? Oh my goodness - I am loving what I am seeing in your boys room. So cheerful!!! great rug, and awesome side table! I can't wait to hear where you found it! Hey Christina - love the rug. Braces? Wow you are brave. Also, speaking of tortoise shell - I'm dying to do faux tortoise in my next set of hardware. Why is it so friggin hard to source? Hey guys!!! Rug is from Overstock..I just check and it is sold out except in the round. Let me do some more investigations. Wizzle..so glad you were able to shake your prickliness;-)..as for the pillow I found it at an antique store in SLC. There are also some new ones that are out there circulating as well if you want the source. 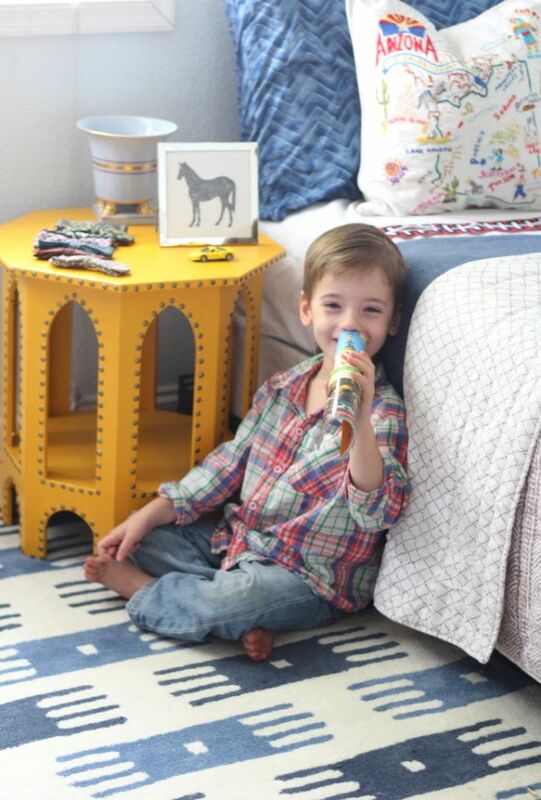 How cute is he (and his room?!!)!?? Perfect rug for your three! I admire your patience and willingness to stick with it to get the right one. Braces?! Like on your teeth? I've been thinking about doing that...been carrying around a manila envelope of my xrays to take to the orthodontist. Did you get a color, ha!? great rug! I love the ethnic and fun feel! Can't believe how old your little guy looks! I'd love the source for the pillow. AZ Pride. (: Adorable room!